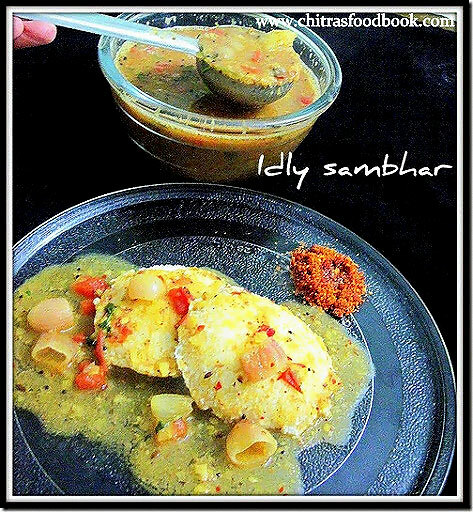 I've posted varieties of idli sambar learning from my MOM & MIL.This one is my MIL's special sambar. Sendhil loves this a lot . So I make it at least once in a week.It tastes similar to hotel sambar. 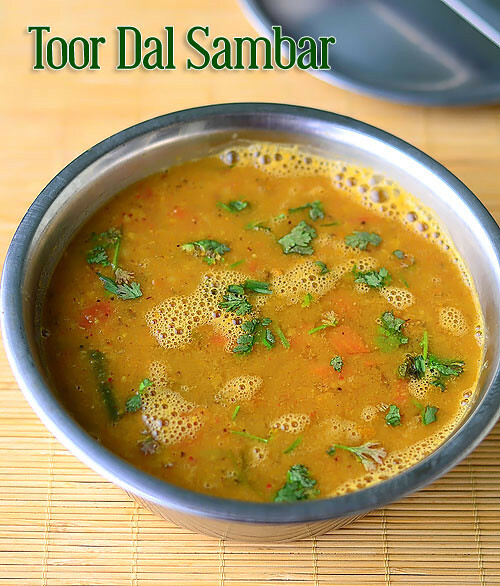 I make this sambar for Idli, dosa and pongal specially for my guests. Other common names are तुवरि (tuvari) in sanskrit, arhar(Hindi/Bangla:অরহর), Rohor (Assamese), Rahar (Nepali), red gram, toovar/toor (Gujarati/Marathi/Punjabi), tuvaram paruppu (Tamil: துவரம்பருப்பு),tuvara (Malayalam :"തുവര" ),togari (Kannada), Kandi(కంది)(Telugu), Yewof ater (Amharic), gandul, guandul, guandu, Congo pea, Gungo pea, Gunga pea, and no-eye pea. Soak the tamarind in warm water for 20 minutes and take the extract using a cup of water. Set aside. Pressure cook all the ingredients given under "to pressure cook" till one whistle.Mash the dal and set aside. Heat oil in a kadai and roast all the items given above in the same order till nice aroma arises.Powder coarsely and keep aside. In the same kadai , add oil and saute the items given under “To Saute”.Saute till tomato turns mushy.Then add the sambar powder, tamarind extract, hing & salt. Add some raw curry leaves. Allow it to boil till the onion gets cooked.Lower the flame. Now add the mashed dal & powdered spices. Mix well & boil for sometime( Be careful while adding the powder because it may form lumps.So gently stir in & sprinkle the powder simultaneously.) When it boils, add jaggery & boil for some more time. Enjoy with soft idlies & crispy dosas by adding sesame oil !! 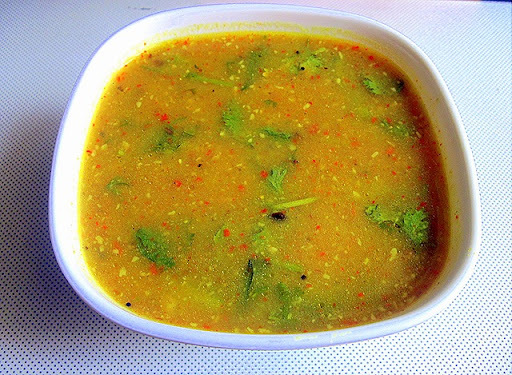 For restaurant style sambar, add a few curry leaves while roasting the ingredients given for sambar powder. 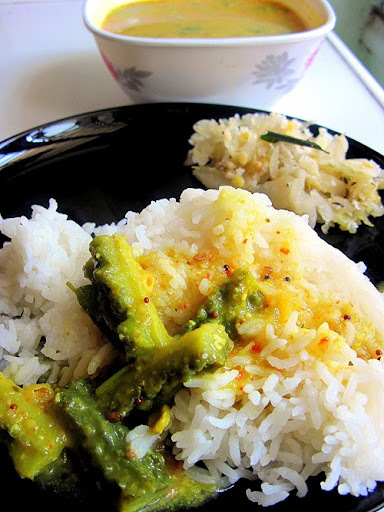 ** Also try adding a tsp of grated coconut for additional flavor while roasting. ** Add veggies like brinjal, Drumstick and carrot to make it more healthy. 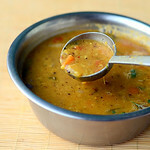 In this sambar, we should add very less tamarind extract.So it will taste mild and less spicy. If u want it more spicy & tangy , add pinched red chillies while tempering and squeeze some drops of lime juice before serving. 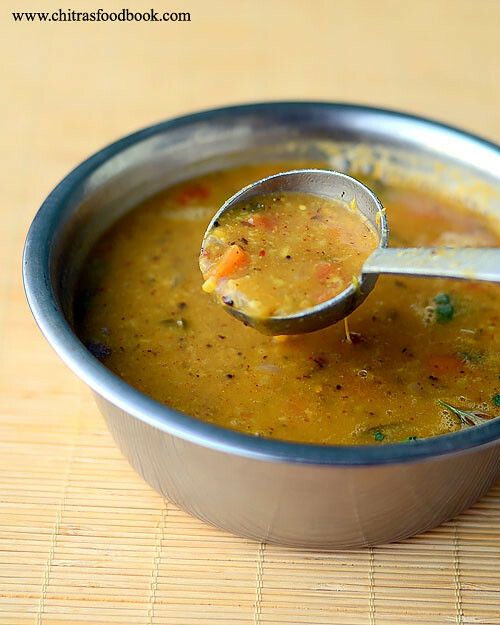 Enjoy this yummy, delicious Sambar with hot idli ! Aloo bonda, Potato bonda, Urulai kizhangu bonda, urulaikilangu bonda, Alu bonda, stuffed bonda etc etc. 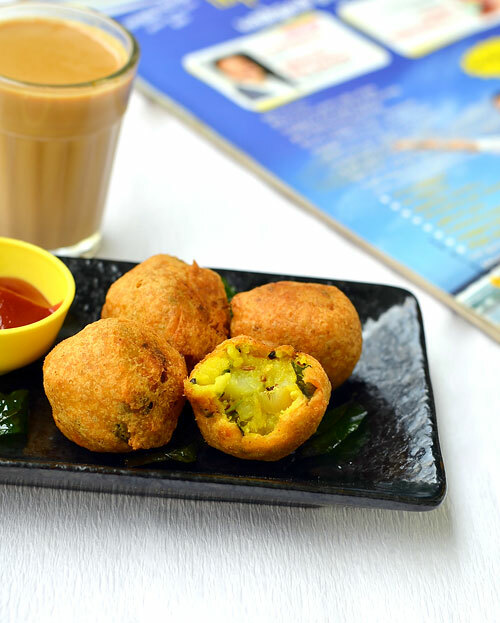 – This yummy South Indian Tea Time snack with a crispy exterior and soft interior with potato masala stuffing is called by different names in different languages.Whatever be the name it’s one of the most favorite Tea time snacks for kids and adults as well. 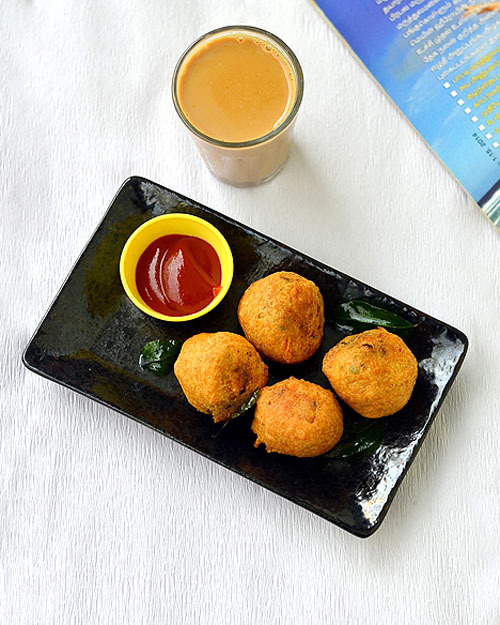 Raksha loves Onion bajji and Potato bonda among all the deep fried snacks.So I make this very often in my kitchen after she comes back from the school. To make bajji and bonda, I always follow the ratio of 3:1 besan and rice flour to make bonda or bajji. It never fails for me.Do try this recipe by following the tips I have shared here.You will get it perfect. 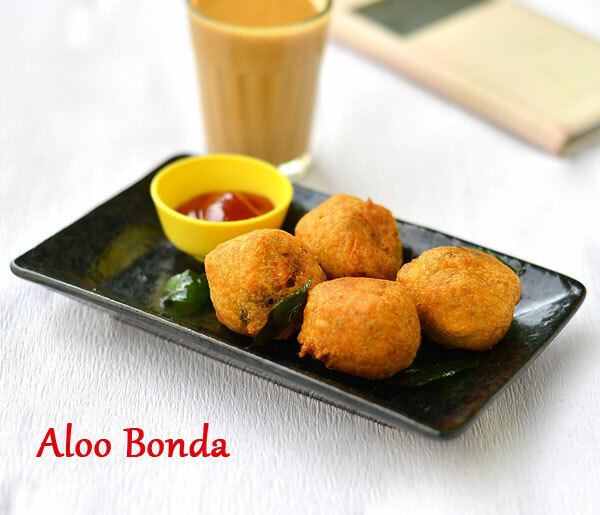 Ok, lets see how to make this crispy aloo bonda recipe. Wash and pressure cook the potatoes.Peel the skin and mash it well.Set aside.Chop the onions,chilli,ginger and coriander leaves. Heat oil in a kadai and splutter mustard seeds,urad dal,chana dal and curry leaves.Add onions,green chillies,ginger bits and saute well.Now add the mashed potato.Mix well.Add salt,turmeric powder and mix well.Make it like a thick dough.Lastly garnish with coriander leaves and keep the masala ready.Sprinkle some lemon juice if needed. Make a small lemon sized balls out of the stuffing and keep them in a plate. In a wide bowl,take the besan flour,rice flour,red chilli powder,cooking soda,hing,salt and pinch of food color if needed. Mix everything well.Add water and make a cream like paste.The batter should be thick and fall like a ribbon.Do not add more water and make the batter thin because thin batter makes tails while you drop the bonda in oil whereas very thick batter gives you hard bonda. So the quantity of water is very important. Do not add more cooking soda. Bonda absorbs more oil. Similarly do not avoid cooking soda. It makes the bonda hard and less crispy. Heat oil to deep fry. 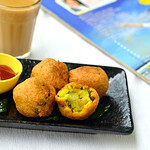 Drop a pinch of batter and if it rises immediately,oil is ready.Now take the potato ball and dip in the batter.Coat the balls well with the batter and drop in the hot oil.Cook in medium flame by turning the bonda at regular intervals.Remove when it turns golden brown.Drain the oil in a tissue and serve hot with coconut chutney or tomato sauce ! Enjoy with hot tea ! Make this kids favorite evening snack once they are back from school.They will enjoy it ! Soak tamarind in warm water for 20 mins and take the extract. Add salt , sambar powder and turmeric powder.set aside. Now in a kadai , heat oil and add the tempering items in the same order.Saute for a while.Now add the chopped lady's finger pieces and saute well. Saute till lady's finger cooks well. Now add the tamarind extract and allow it to boil till okra gets cooked. Add a small piece of jaggery. Switch off the flame.Transfer to a bowl and add a tsp of gingely oil .Cover it and serve after 30 mins.This gives a special flavor for the gravy. 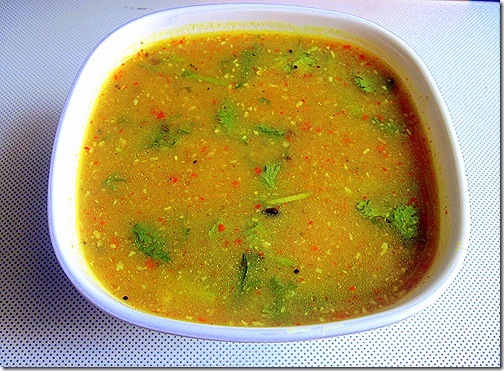 ** For sambar powder recipe, please click for homemade recipe. U can use your homemade or store bought powder too.There will be no change in taste I guess.. I was searching for a low fat , steamed snack . I got this recipe from a blog . I did some changes and tried it.It was very soft & tasty. Take the water in a kadai and allow it to boil by adding the salt & a drop of oil. As soon as it starts to roll boil add the measured rice flour and stir well without forming lumps. It will become a soft, non sticky dough. Let it cool. Then knead it well and make very small balls out of the warm dough by greasing ur hands with little gingely oil. 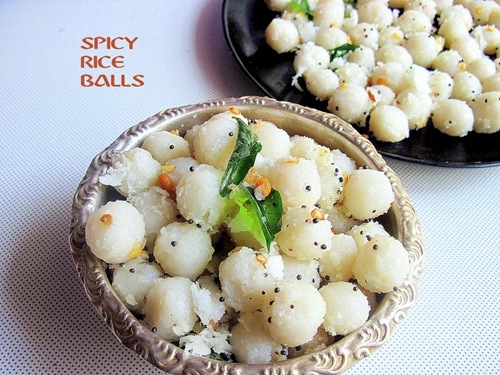 Steam cook the balls by arranging them in idly plate. It takes nearly 10 mins to cook. Now remove the balls carefully and set aside. In a kadai heat the oil and temper the items given above in the same order. Add the balls at the end and toss well. Check for salt and mix the grated coconut. 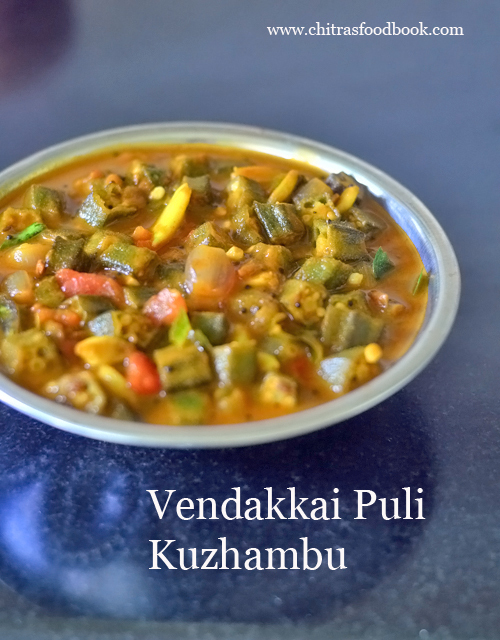 I learnt this delicious kuzhambu /rasam from my MIL.Just like Kazhani kuzhambu , this is also an easy , unique recipe.I usually make pitlai with BG.But this is something different in taste and the procedure.Here comes the recipe with the picture..
Slice cut Bittergourd with 1 inch thickness. 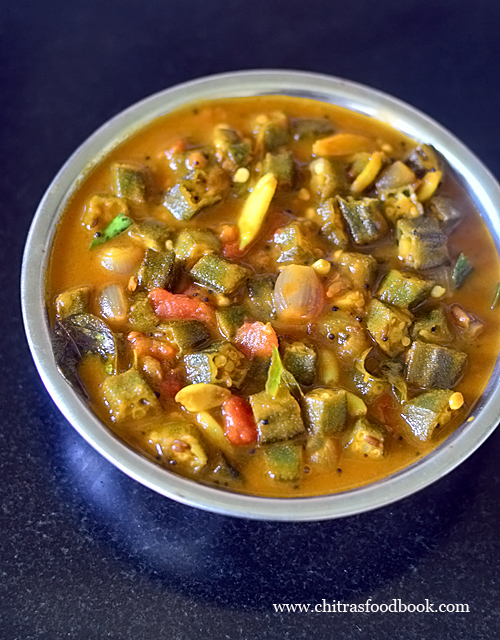 In a pressure cooker , take the bittergourd slices and cook till 1 whistle. Take a tsp of oil in a kadai and roast the ingredients given above. Powder it coarsely and set aside. In the kadai , heat oil and temper the items given under "to temper". Now add the tamarind extract , salt , hing and curry leaves. Add the cooked bittergourd pieces and allow it to boil for sometime. Now mix the coarsely ground powder and boil for 5 mins. The mixture should be watery in consistency. Finally garnish with coriander leaves. Serve hot with plain rice & papad. 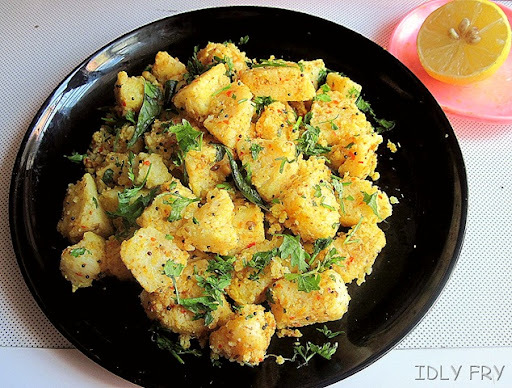 Recently my MIL was telling about the idly fry she had in her brother's place. I was attracted by the simple recipe and we tried with the left over idlies.It was very nice & tasty. Usually i add G&G , garam masala to make the fry. But this version is completely different from mine.No need to deep fry the idlies too. So its an easy & low calorie food.Do try this let me know friends. Lemon juice - few drops to taste. Heat oil in a kadai and roast the items given under "To roast & grind " except coconut. 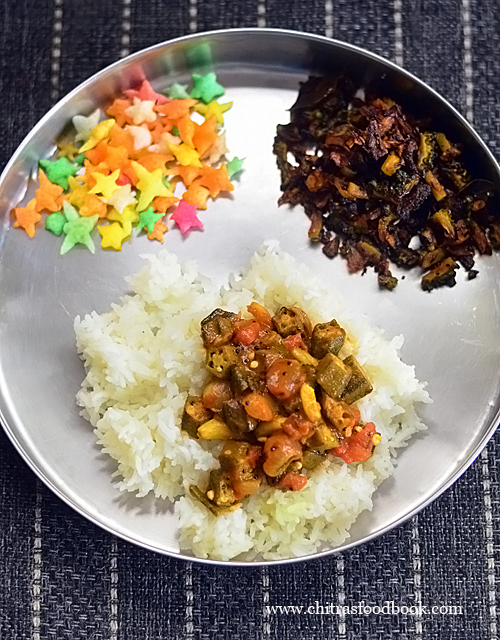 Grind all the roasted items along with grated coconut.Add little water & grind to a smooth paste.Set aside. Cut the idlies into small cubes.Mix the ground paste and toss well. Take care the idly pieces should not break. In a wide mouthed kadai , add oil and temper the items given above . Now add the masala coated idly pieces and saute well for few minutes by simmering the flame.Saute till the raw smell of masala disappears. Switch off the flame and add the lemon juice. 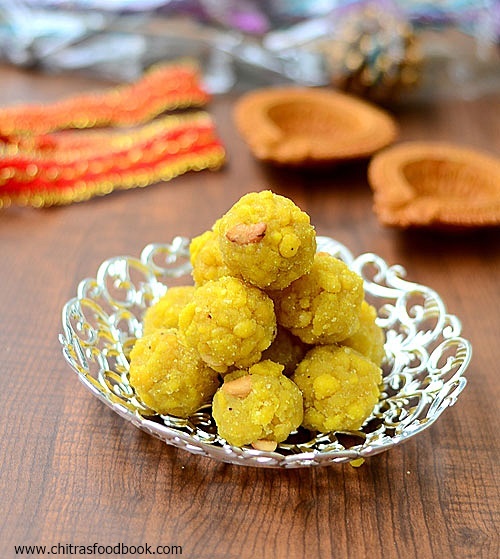 Coming to this post, I learnt this from my MIL.She is an expert in making badusha, ladoo, adhirasam ,burfi etc.I told her to make this boondhi ladoo for my husband's birthday and of course for blogging too .This is our South Indian style Boondhi ladoo which is very popular in Tamil nadu.This is prepared by mixing fried boondhi in thick sugar syrup & made as balls.The consistency of sugar syrup is very important for this sweet recipe.In North India, people make a ladoo named Motichoor ladoo using the same ingredients but in a different way. I will try to share that recipe in future.Now lets see how to make boondi laddu with pictures ! Heat oil in a kadai.Take the batter and pour it in a sieve or ladle with round holes. Start making the syrup only after making boondi.If you make sugar syrup in the beginning,it will crystallize. Now take a pan.Add sugar & cover with water.Let it boil & make the syrup of **two string consistency or gathering stage. ( ie.pour few drops of syrup in a plate with water.If u try to gather the syrup,it will come together but you will not be able to shape them or take it in hand.It will dissolve) Check out my sugar syrup post for better understanding.Please be careful because this stage will come immediately after single string consistency.So be careful.You can add few drops of lemon juice to avoid crystallization.But it is not needed as you are going to add the prepared boondi immediately after the syrup is done.Act fast here. Add cardamom powder, sugar candy,Fried cloves & cashews. Add the fried balls to the syrup and mix well. 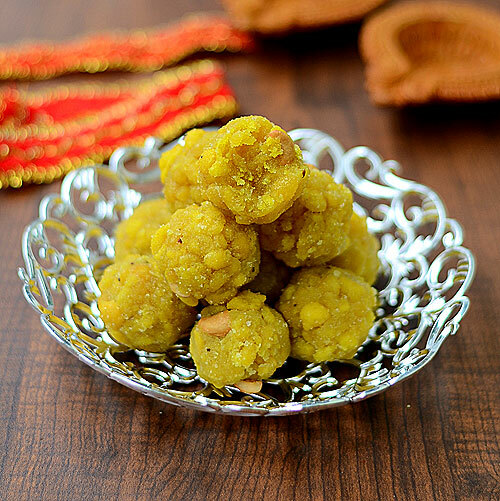 Grease the hands with ghee and make balls of desired size when the mixture is still warm. If u wish to serve as boondi, just mix the sugar syrup,cardamom powder,fried cloves and mix with a ladle. serve!! Soft ball consistency :Take the syrup in a bowl with water and gather the syrup.U will able to gather in one place but you cannot take the syrup in your fingers.It will dissolve.This stage is achieved in few seconds after the one string consistency.So keep an eye.This is also called as two string consistency.If you are able to bear the heat,u can test in between the fingers. If the mixture cools down, balls cannot be made properly. If the sugar syrup crystallizes before mixing the fried balls, add little water to the syrup , boil and bring it to the correct consistency. 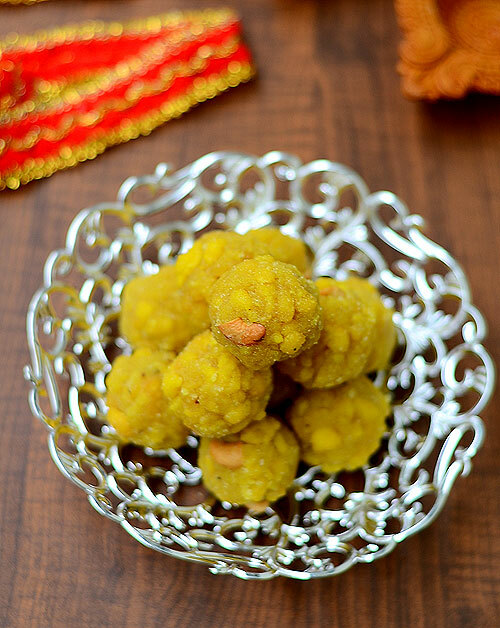 Store the ladoo in an air tight container .Its shelf life is 10 days. This is my MIL’s special recipe.We bought some sour raw mangoes and i told my MIL to make something special with it. she told me about this kuzhambu and we tried on the same day. It was excellent .Its very simple to do. If u get sour mangoes, do try this .I am sure u’ll love it.It got a similar taste of puliodharai /puliyogare.Thanks a lot to my MIL for teaching me this yummilicious gravy / kuzhambu.I loved it.. .
Wash the raw mangoes and slit cut into 3 pieces. Please refer the above picture . Add these mangoes into the kazhani and cover cook till the mangoes cook nicely. Take care it should not be overcooked and becomes mushy. Add 1/4 tsp of hing & curry leaves while boiling. Now in a kadai , add a tsp of oil and roast the items in the same order. Once the mangoes are cooked , add the coarse powder and allow it to boil for 5 mins. u’ll get a nice flavor. Finally temper the kuzhambu & give some 30 mins standing time before serving .. Enjoy with plain rice & papad.U can add a tsp of sesame oil in plain rice for additional taste. Please grind the powder in a coarse form to get the kuzhambu in watery consistency.If u grind it fine , u’ll get a thick gravy. Please make it the way u want the gravy to be. Hing should be twice here. One time in raw and another time while roasting. Dont forget to add a pinch of tamarind. No need to soak & extract.. it will dissolve in the gravy.If u have the ready made paste , just add a drop of it. I think most of u know and make this porridge .U all may wonder if i say this is the first time i am making this .Yes, for the first time i prepared this quick , delicious porridge and enjoyed for breakfast today.I got this recipe from a blog , made some additions and relished with pickle . Soak the oats in water for 15 mins . This step is purely optional. Pressure cook the oats till one whistle.Mash it well with a ladle. Temper all the items given above and add it to the oats mixture. Mix well.Garnish with coriander leaves. If u feel the porridge is too sour, add milk or water to reduce the sourness and adjust the salt accordingly . U can add finely chopped raw mango pieces to get a nice flavor and taste.